1. I am happy to be here amidst you in this holy city of Jerusalem. It is a great privilege for me to be the first Indian President to make a State Visit to Israel. I am accompanied by H’ble Minister for Social Justice and Empowerment, Shri Thawar Chand Gehlot and a multi-party delegation of H’ble Members of both Houses of the Indian Parliament. Since we arrived in Israel, we have been deeply touched by the friendship, goodwill and hospitality of the people of Israel. 2. I bring to you the warm greetings of the people of India. Needless to say, we have been looking forward to this occasion. Your community represents a cross section of the Indian people. You are here as students, caregivers, professionals and businessmen; some of you are serving in the United Nations Disengagement Observer Force(UNDOF). I wish to particularly recognise the Indian Jewish community in Israel – who continue to cherish India. I would like to make a special mention of Jerusalem’s 800-year old Indian Hospice and pay tribute to Sheikh Nazer Hassan Ansari. 3. Friends, India is very proud of its large diaspora. Indians all over the world are successful not only as dedicated professionals and hard working businessmen, but also as model citizens. They are proud of their contribution to the society in which they choose to live and work; yet they nurture in themselves and their younger generations an enduring "Indian-ness” and an undying love for their motherland. I commend you all. 4. Friends, India has always regarded Israel as a valued partner. In fact, West Asia as a whole and the Gulf have always been a priority for India. Not only do we have ancient and civilisational ties with these lands and peoples, but today, some 7 million Indians live and work here. The countries of this region are India’s vital partners in the energy, hydrocarbon and mineral sectors. We shall continue to pay special attention to them and seek closer cooperation and stronger partnership with them for our mutual benefit. 5. This is a time of great opportunities in India. A unique transformation is taking place. The country is at the threshold of a new era of rapid economic development. Several recent initiatives of Government have already shown results and a positive impact has been created in key sectors. The 'Make in India' campaign to make India an investment and manufacturing destination, the ‘Digital India programme’ to transform India into a digitally empowered society, ‘Smart Cities’, ‘Model Villages’, ‘Swachh Bharat’ and the ‘Clean Ganga mission’ are some of the flagship schemes. In the last year alone, Government of India has succeeded in encouraging our people to open almost 140 million bank accounts under ‘Jan Dhan Yojna’. 6. In the realm of external relations, I am happy to say that Government has intensified India’s engagement with her neighbours and all friendly countries across the globe. In August, the Forum for India-Pacific Island Co-operation was hosted in Jaipur ; later this month, New Delhi shall host the largest ever gathering, in India, of Heads of State and Government of the African Continent in the 3rdSummit of the India Africa Forum. India is working with like-minded countries in multilateral organisations including the United Nations to play an enhanced role in diverse fora – from the Arctic Council and the Pacific Alliance to the UN Security Council where India has made a legitimate claim to permanent membership. The potential of India now has a stronger resonance. Our circle of friends has expanded. India’s efforts for inclusive economic growth and social advancement have shown the way to many developing countries. 7. I would like to take this opportunity to emphasise the potential of India-Israel collaboration in Science and Technology. Our future partnership must prioritise co-operation in innovation and research. Eminent Vice Chancellors of premier Indian Universities have accompanied me on this visit. Their Universities look forward to close exchanges with Israeli Universities. I am confident that our hard working students will do India proud in Israel. 8. I see among you many members of the Indian Jewish community. 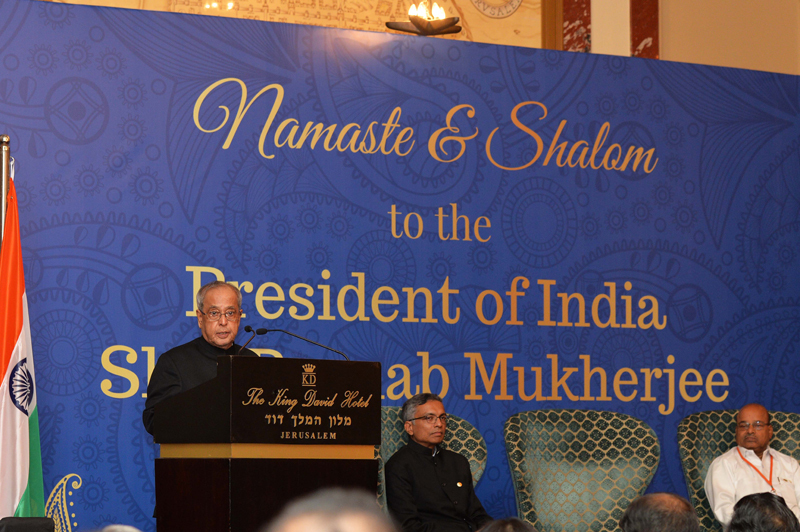 You have distinguished yourselves through your achievements – both in India and in Israel. In Mumbai you have contributed leaders in business, education and the literary field. In Kolkata, the Magen David Synagogue and the Jewish Girl's School are historic landmarks. I recall that in 1968, former Prime Minister Indira Gandhi had attended the 400th anniversary of the synagogue and released a commemorative stamp. I understand that all the four Jewish communities in Israel have come together to host a National Convention of Indian Jews in Israel. I compliment you on this initiative and wish you success. 9. Before concluding, I would like to thank the friendly people of Israel for making the Indian community here feel welcome and valued. We are two countries with ancient civilisations, much like the two branches of a bountiful tree. India looks forward to strengthening the friendship and co-operation between our peoples in the years to come. 10. With these words, I thank the Ambassador of India for hosting this reception and thank you all for being here. To each one of you, I extend my best wishes for your well being, progress and many proud achievements. God Bless you all. Jai Hind.